I first told this story at Celtic Crossing, Memphis, Tennessee, on the eve of St. Patrick's Day. I'm going to tell you everything historians know about St. Patrick. 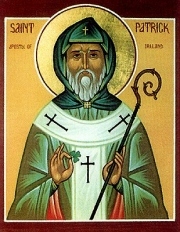 There is very little, historically verifiable, information or evidence about St. Patrick. We don't even know how many there are. The annals of Ireland contain a wonderful history of the people of Ireland, but the annals weren't written until several centuries after the death of St. Patrick. 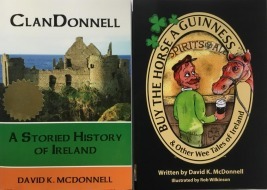 There are many references to St. Patrick in the annals, but these are based upon prior oral histories, recorded for the first time by the writers of the annals. How accurate are the annals in this regard? Who knows? All we have by way of contemporaneous records are two letters written by St. Patrick, one of which is a somewhat autobiographical. This letter is currently at Trinity College in Dublin. We do know from St. Patrick is that he was a Briton. The Britons were one of the several Celtic groups which migrated from continental Europe to the British Isles. The Romans invaded the land of the Britons in about 43 A.D., and over time, the Britons became less Celtic that the people who lived in Ireland or Scotland. But among other things, the Romans brought Christianity to the region. Patrick's parents and grandparents were Christians, according to Patrick's letters, but it is not at all clear whether Patrick was, at least when he was a boy. Irish raiders captured Patrick when Patrick was still a boy. Literature about Patrick usually describes these Irish as 'pirates', but that is likely a misunderstanding of the Celtic clan culture. The Celtic clans were close-knit communities, and people within a clan felt a great deal of loyalty and attachment to others within their clan. But people within a clan didn't give a damn about any who was outside of the clan. Indeed, one of the favorite pastimes of any Irish clans was raiding a neighboring clan. The annals of Ireland often describe a clan raid by saying something like: "The O'Neills raided the land of the O'Reillys and took all of the movables." The word movables is one of my favorite words in the annals, since it leaves so much to the imagination. Movables certainly includes cattle, sheep, harvested food, and weapons. It may also include furniture, pots and pans, and anything else not permanently tied down.